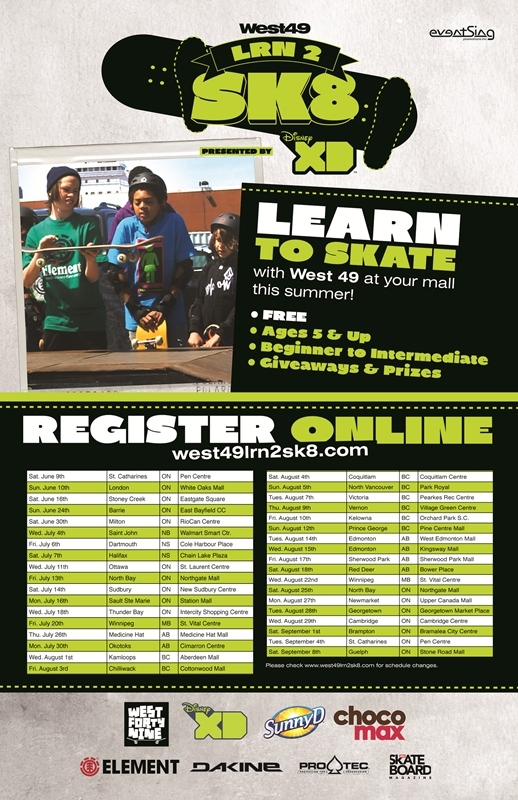 West 49 LRN2SK8 is a one day educational event providing an introduction to the culture of skateboarding and skateboard instruction to beginner skateboarders, age 5 to 15. Starting this June (2012) and running through to Labour Day The West 49 LRN2SK8 Tour presented by Disney XD will be making 40 stops at West 49 locations across Canada (mall parking lots and nearby community centres). The LRN2SK8 program will provide participants a full West 49 skateboard experience in an enclosed mobile skatepark that includes the Sunny D Street Course featuring Element Drop Spot obstacles. The Medicine Hat event is taking place on July 26th, 2012 at the Medicine Hat Mall. Managed by eventSing promotions inc. which has more than a decade experience in packaging and producing national action sports events, this program is designed to help youth develop their confidence and skateboard skills and will provide participants with a legitimate skateboard experience in a supervised and safe area. From prize give-aways, sampling opportunities and a mobile skate park set up with all the equipment necessary to develop an individual’s skateboarding abilities, the LRN2SK8 program will be a great opportunity for kids across Canada to really have a true skateboarding experience with access to course components like rails, ledges, ramps and flat bars. The program will include the following elements: mock-classroom lessons where trick description and the history of skateboarding will be reviewed, Build-a-Board Workshop learning how to install bearings and apply grip tape and small group lessons aiding in individual progression execution and analysis will be taught with skate-educated seasoned riders providing the lessons. There are three sessions available: Session 1: 9:30am to 11:00am, Session 2: 12:30pm to 2:00pm and Session 3: 3:00pm to 4:30pm. Waivers must be signed on site by a legal guardian. The classes will end with a graduation ceremony and each skateboarder will receive a certificate for participating and completing the program. This entry was posted on Wednesday, July 18th, 2012 at 9:47 PM and is filed under News & Announcements, Other Events. You can follow any responses to this entry through the RSS 2.0 feed. You can leave a response, or trackback from your own site.